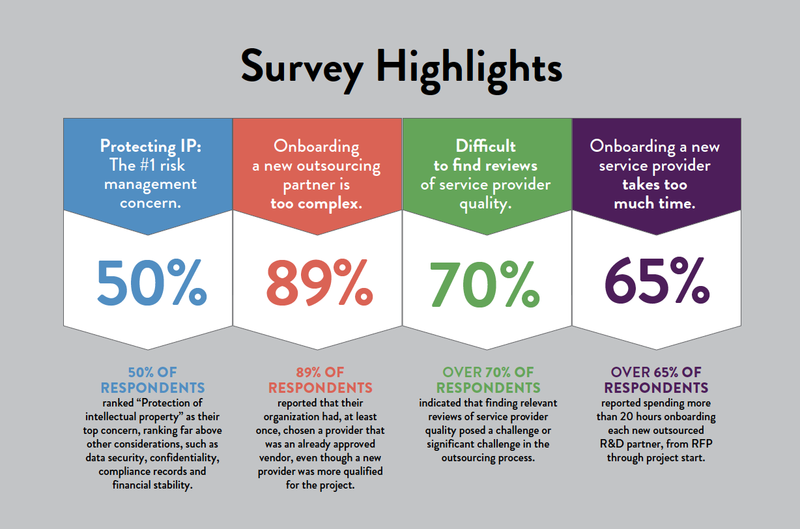 PALO ALTO, Calif.– More than 100 biotechnology and drug development leaders who responded to surveys conducted during industry conferences earlier this year reported a wide range of barriers to the outsourcing of research and development (R&D) services, including the contracts review process, intellectual property (IP) security concerns, and service provider qualification. The surveys were conducted by Science Exchange, the world’s leading and most secure platform for outsourced research and development (R&D), during the 2017 Biotechnology Innovation Organization (BIO) International Convention and 2017 Drug Industry Association (DIA) Global Annual Meeting. Time management related to R&D outsourcing was also reported as having a significant impact on these R&D leaders, with over 40 percent of those responding to the survey indicating they spent more than 20 hours to onboard each new outsourcing partner, from the request for proposal process, through contracting and start of the project. Finally, further demonstrating the impact of the time spent on administrative tasks related to outsourcing, more than 75 percent of survey respondents reported that the “hassle” of bringing on a new partner has previously led them to choose an existing vendor rather than seek out a more qualified option. See how your organization could streamline outsourced R&D through Science Exchange — request a demo of our platforms for enterprise clients.